The Pyramids of Giza: conspiracy or science? Why are we still so clueless about the pyramids? Built around 4500 years ago as tombs for the Pharaohs with almost no technology, how did those enormous structures come to be? A simple answer to throw any other argument out of the window would be: aliens. But for now, we’re going to ignore the possibility of extra terrestrial contact and attempt to understand the science behind the pyramids. Let’s start with the mind-blowing exterior of the pyramids – how on earth did they get those stone blocks up there? Pharaoh Khufu’s Great Pyramid is roughly 147 meters tall and has about 2.3 million stone blocks, each weighing between 2.5 to 15 tons. These pyramids are so massive that they can be seen from space. Logically, the Egyptians would need even greater and heavier machines in order to carry those blocks so high above ground, but there is no sign of such a machine anywhere. Many attempts have been made in order to explain how the materials were built and transported, such as the wet-sand theory. This suggests that the ancient Egyptians built the stone blocks far away from the pyramids and dragged the blocks to the site on wooden sleds. It would be ridiculously difficult to drag such objects in the sand, because they would sink, so the theory is that the Egyptians wet the sand in their path, which helped to solidify the surface of the sand, in order to help the stones to glide to their destination. 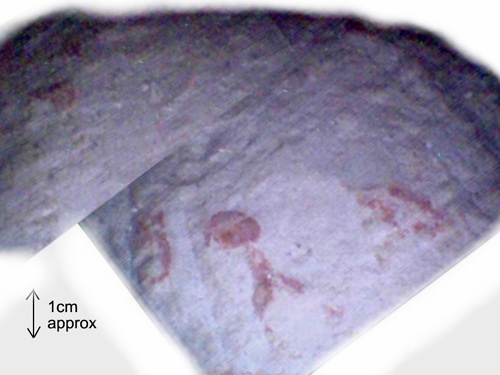 This explanation makes sense and is even supported by a wall painting in the tomb of Djehutihotep, depicting workers transporting a statue, while another worker stands on the edge of the sled and pours what seems to be water onto the ground. Although this seems to be a logical explanation, we can never be sure of what the ancient Egyptians really did at the time. Even though we have an idea about the transportation of the stone blocks, we still have no explanation as to how they were raised above ground. Aside from the fact that it seems nearly impossible for the workers to have lifted the blocks, the placement of these blocks was also very calculated. The blocks were not simply stacked on top of each other, but empty spaces were left on each stone block layer during the building in order to carve the secret chambers that would flabbergast the archaeologists of the future. This leads us to another unsolvable mystery – how are the archaeologists of today unable to understand the interiors of the pyramids? With the technology that the ancient Egyptians had, or lacked, it should have been impossible to build with such complexity. 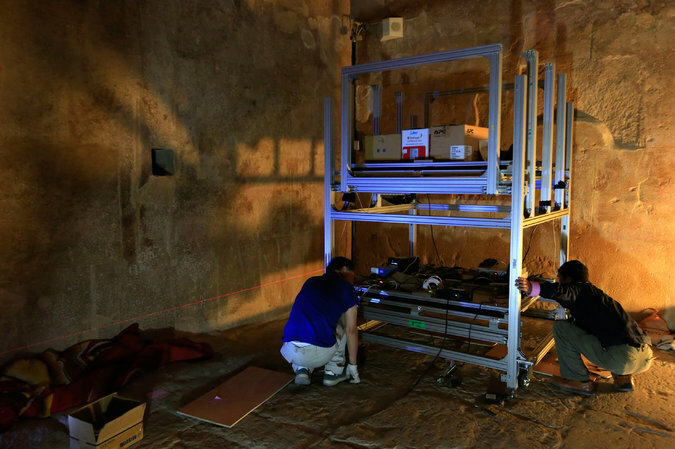 In order to keep the pyramids from being damaged, LED technology is being used to figure out what the pyramids contain. We would assume that this would provide more information about the pyramids without risking lives or the sites, but to no avail. Although archaeologists have deduced that the purpose of the Pyramids was to be the tomb of the Pharaohs, neither Khufu’s body, nor his treasure chamber has ever been found. 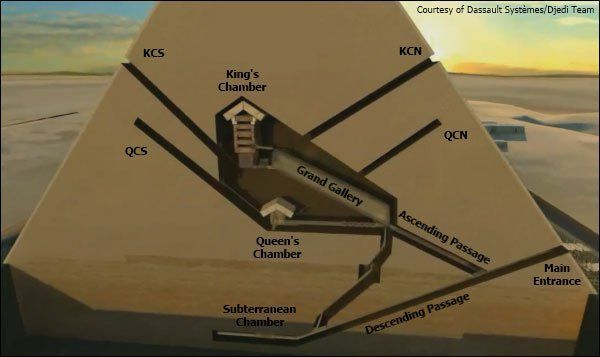 What makes this all the more interesting is that a sarcophagus with a stone ‘gate’ was made in Khufu’s pyramid in order to prevent grave robbery. If the ancient Egyptians saw the possibility of grave robbery occurring, they thought that even simple thieves could enter the pyramids and have a chance of finding Khufu’s treasure. So why are we so far from it? Another intriguing fact about the chambers is that some might not even be functional. Only in 2003 did a tiny robot successfully enter a small, secret chamber that contained red hieroglyphs and, interestingly, pieces of metal. Metal is not found anywhere else in The Great Pyramid, so what is it doing here? As I have mentioned, it is believed that the room was built for more spiritual reasons rather than functional, but it is still shocking to know that this room was not found with laser technology, but with luck when a robot was sent to drill a wall. Last but not least, the newest update from The Great Pyramid is the massive void that has recently been found using muon tomography – similar to an x-ray that uses cosmic rays. This void is almost 30 meters long and is the largest inner structure to be found since the 19th century, so how did we miss it? The everlasting battle between conspiracy theorists and archaeologists has left many people confused. It is almost unbelievable how we can be so advanced yet fail to understand structures that have been built centuries ago. Why did the ancient Egyptians decide to be so secretive about their tombs? Did they use any advanced technology that we still have not come across? Unfortunately, until science comes up with a better explanation, we have been left to guess answers to these questions on our own.